The highlights for me in this posting, and probably in the exhibition if I actually saw it, are the works of Alfred G. Buckham and Iain Mackenzie. These ever so romantic constructions are, in effect, flights of fancy. Buckingham wanted them to be as accurate as possible to ‘the effect that I saw’ through effect – he “collaged or hand-painted the form of a tiny aircraft to enhance the vertiginous effect” and also to enhance the surreal nature of nature. Just imagine the skill needed to combine multiple negatives and then hand-paint aircraft and airships, such as the R100 below, at the correct scale and delicate composition into the photographic image. Impressive not just from a technical perspective (the taking of the photographs; the montaging of the negatives) – but also from an aesthetic, sensual and spiritual perspective of the land and the air, the clouds and the sky. The stuff we breathe and the clouds that we observe everyday. Speaking of the everyday, the second artist that I admire in this posting for his down to earth photographs of everyday life, is Iain Mackenzie. You can see many more of his photographs than are in this posting on the National Galleries of Scotland website. Notice the isolated figures in the brittle, urban landscape – the large, empty white-washed windows, the large signs, the “weight” of the heavy space that hangs above the grounded figures: The Cabin Restaurant, Shoe Repairs, The Govan Restaurant, Enjoy Your Seafood in Comfort! The desolate streets of downtown Glasgow where the Shoe Repair Shop man stares straight at the camera, while his sign proclaims ~ Long Life ~ Repair Specialist. 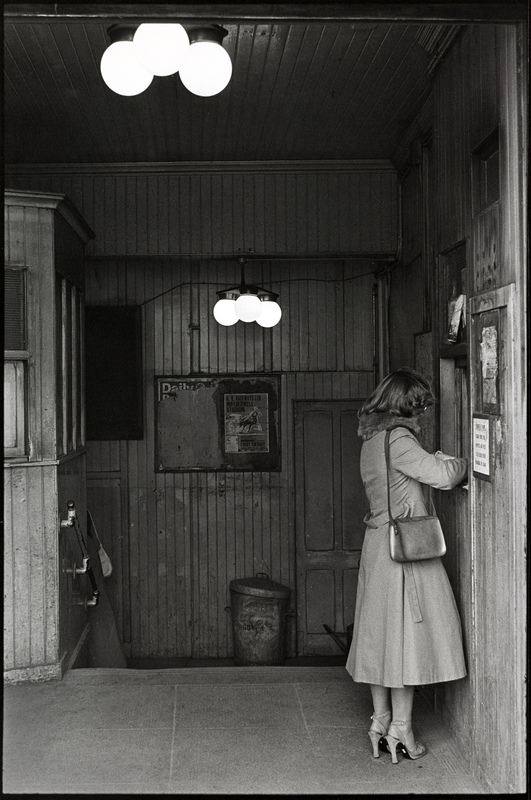 I absolutely love this type of photography, it washes over me and refreshes me, it seeps into my bones and lives there. Because I grew up belonging to this “working class”; they are me when I was young. We had no hot water when I was a child, my mother used to boil the kettle on the stove and fill a bath tub on the kitchen floor to bathe us kids, we were that poor. There is a grittiness about these people, resilience and fortitude, charm on occasion, that Mackenzie captures perfectly. Just look at the faces of the people on the Glasgow Metro. It’s a tough life. Many thankx to the Scottish National Portrait Gallery for allowing me to publish the photographs in the posting. Please click on the photographs for a larger version of the image. 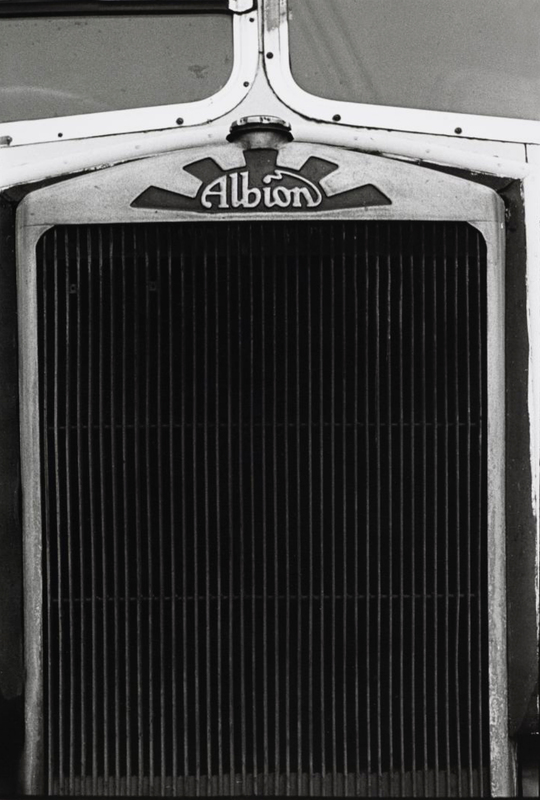 Through work by the likes of Alfred G. Buckham, Humphrey Spender and Alfred Stieglitz we examine how photography has been used to chart the technological innovations created by the desire to travel and the impact that transportation has on society. The exhibition shows how transport is part of our everyday lives, from the daily grind of commuting to the pleasure of holidays away. 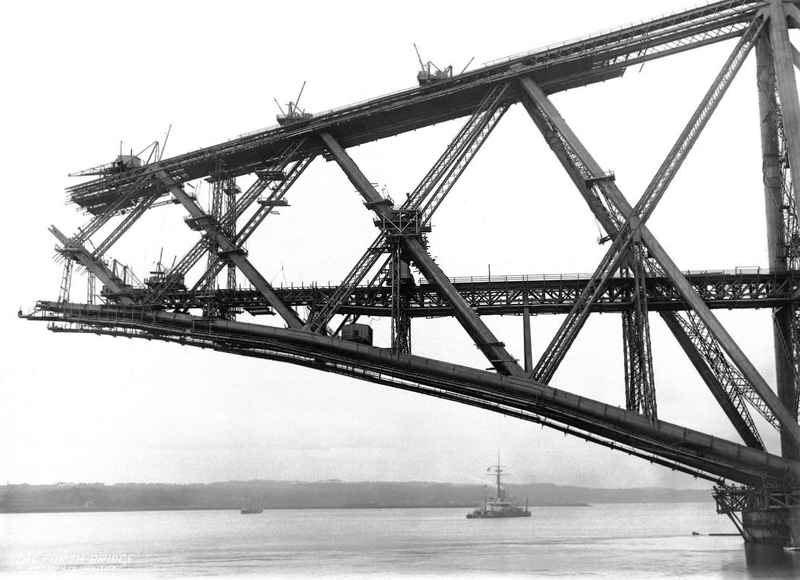 During the construction of the Forth Bridge, the young engineer Evelyn George Carey was given privileged access to the site in order to make a comprehensive photographic record of the bridge’s development. It was hoped that this visual documentation would restore public confidence in British engineering following the Tay Bridge disaster of 1879. 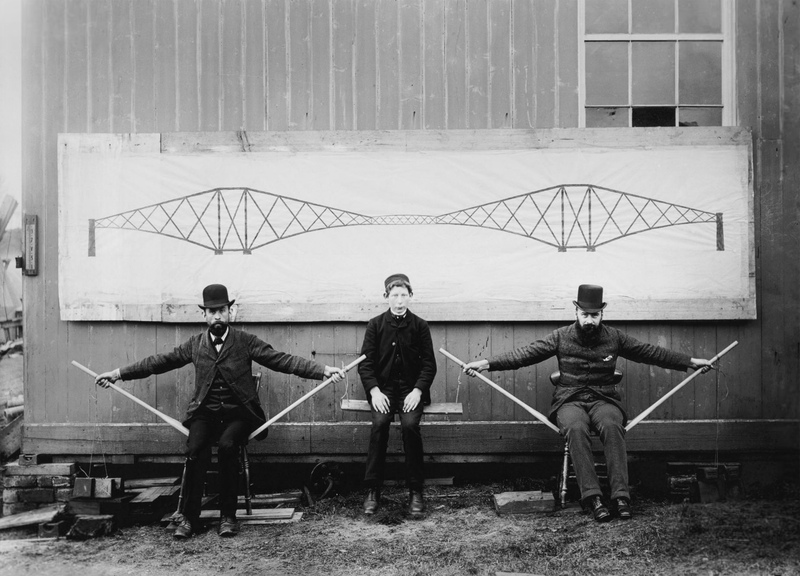 In this photograph Carey uses volunteers, possibly the architects of the bridge Sir John Fowler and Sir Benjamin Baker, to demonstrate the cantilever principle. If you look closely you can see that the boy’s weight is sufficiently supported for his feet to rise off the ground – just as the cantilevers support the central girder of the bridge. The building of the Forth Bridge was celebrated in its day as “a triumph of engineering skill to eclipse the Ship Canal which has turned Africa into an island and a work which will reduce the pyramids to mere child’s play”. Following the disastrous collapse of the Tay Bridge in 1879, the engineers, John Fowler and Benjamin Baker, proposed a revolutionary design. The project was observed and controlled through photography. The official photographer was Evelyn George Carey, who was the assistant engineer from 1883-90. 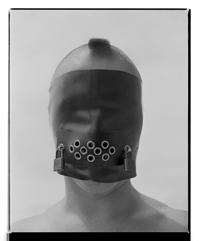 His pictures express the labour, tensions and hazards of the project. Together, his photographs create a sequence, following and examining the course of the construction with a critical eye, and offer an understanding of the later, Modernist fascination with such structures. It was during a journey through Scotland in 1976 that Appelt first saw the Forth Rail Bridge. It made an immediate impact and he began to imagine a film work based on its construction. He returned to the project in 2002, producing a precisely composed photographic montage of the Rail Bridge comprising 312 separate black and white prints. Appelt then began by making a 35mm film, running the camera along the parallel Road Bridge. For the artist, the piece “emerges like a musical score from the filmic frame”, constructing a formal complexity as intricate as the physical laws that govern the original structure. This work lends an expressive weight both to photography and the conceptualisation of one of Scotland’s iconic monuments. The British Government began to build a photographic record of India in 1855. At first this was a random selection of images of important architectural and archaeological sites, produced by amateur photographers working as government officials and amateurs alike. 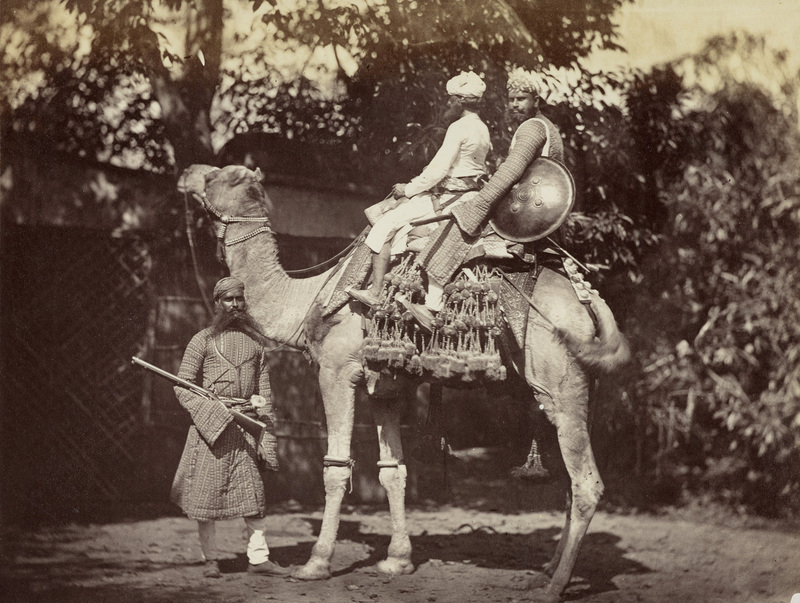 From the 1860s images of Indian society were also added to this archive. Impey, a government colonial official as well as a skilled photographer, made numerous portraits illustrating characteristic Indian types and activities. This scene of a royal court invokes a sense of a timeless Indian past. Such ‘exotic’ scenes were popular with Victorian Britons. 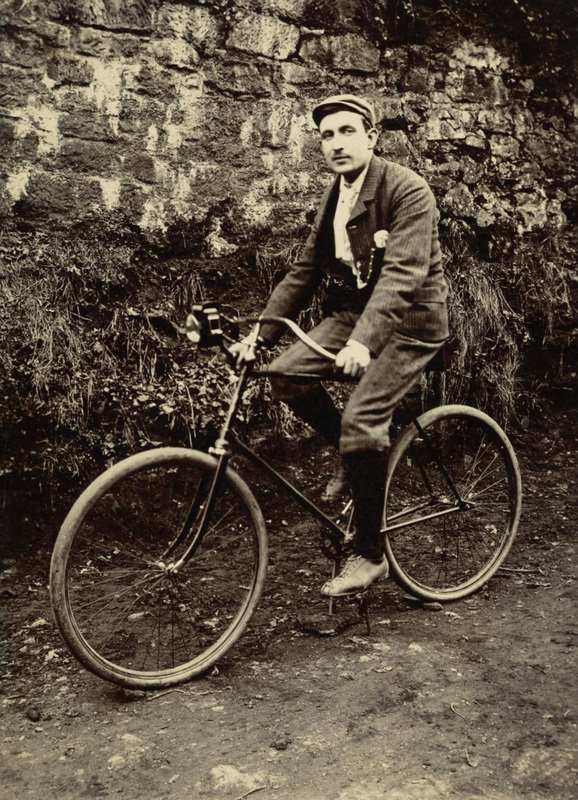 In the late nineteenth century cycling became a popular leisure activity. This was in part due to the introduction of the pneumatic tyre, patented in 1888 by the Ayrshire-born John Dunlop. This made bicycles more reliable and less expensive. Cycling clubs formed across Europe and America and for many women cycling provided unprecedented mobility and freedom. In recent years cycling has seen a resurgence in popularity amongst both sports enthusiasts and commuters. Stieglitz was sailing to Europe in 1907 and found the company of other first class passengers unbearable. One day as he was trying to avoid them, he walked to the end of his deck and looked down into the part of the ship which accommodated the poor passengers. He perceived the ordinary men and women as flashes of colour dotted in among the geometric shapes of ‘iron machinery’. Moved and fascinated by this sight, he raced to his cabin and returned with his camera to take a picture that to him constituted a step in his ‘own evolution’. The extraordinary advances in the technology of travel over the past 170 years, and their wide-ranging impact on our lives are the subject of a dramatic and inspiring new exhibition of photographs at the Scottish National Portrait Gallery this summer. Planes, Trains and Automobiles draws upon the outstanding collection of the National Galleries of Scotland to consider the rapid expansion of transportation from the end of the Industrial Revolution to the present day. It features 70 outstanding images, including key images by Alfred G Buckham and Alfred Stieglitz, which demonstrate how the technologies of photography and transport have evolved in tandem, each of them broadening our horizons and radically altering our perception of our ever-shrinking world. 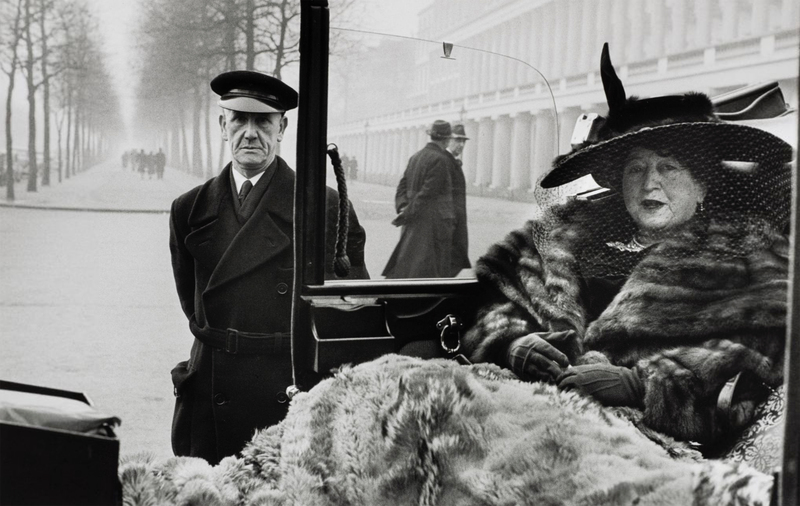 The exhibition includes iconic photographs such as The Steerage, a career-defining image by the American photographer Alfred Stieglitz (1864-1946), made in 1907, while he was travelling to Europe by sea; and Inge Morath’s striking portrait Mrs Eveleigh Nash, The Mall, London (1953). 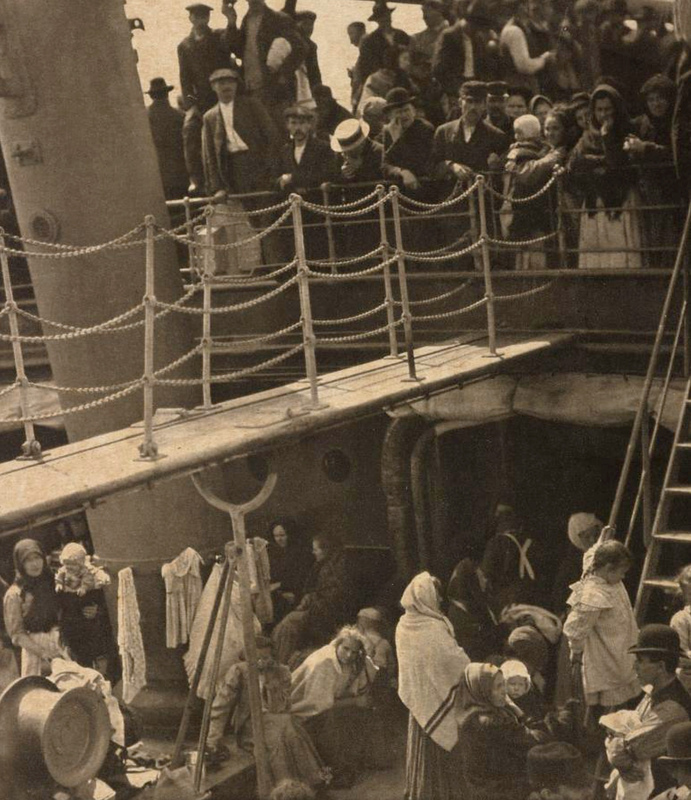 Walking on the first-class deck, Stieglitz looked down into the third-class steerage area below him. Immediately struck by the strength of the composition created by the group of travellers gathered there, he quickly retrieved his camera, and captured the jarring class divide. Celebrated both for its modernist composition and its social commentary, the resulting photograph is one of the most recognisable images in the history of photography. Similarly, Morath (1923-2002), one of the first female photographers to work for renowned photo agency Magnum, used the door frame of an open-topped car to artfully divide her composition, suggesting the social gulf between the wealthy Mrs Nash and her chauffeur. 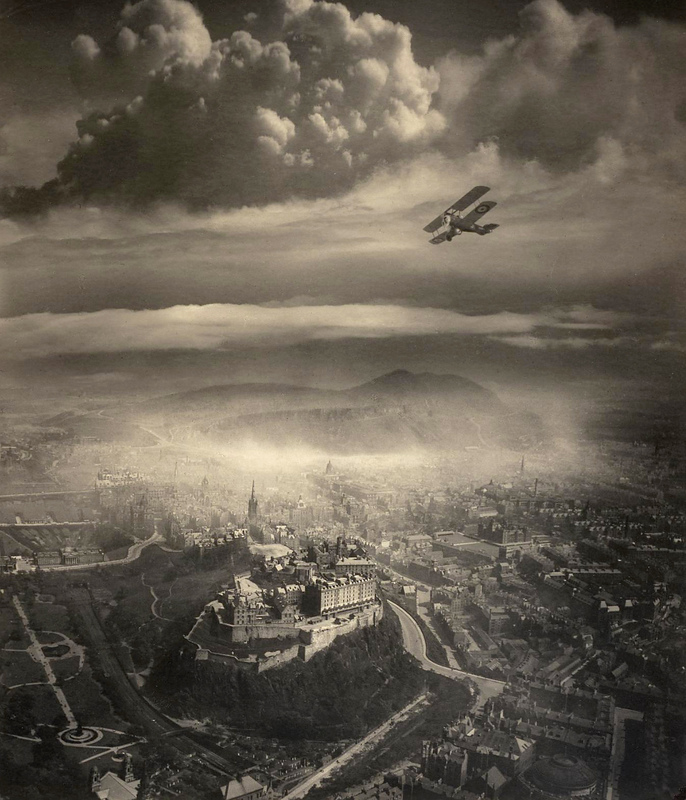 One of aerial photography’s pioneers was Alfred G. Buckham (1879-1956) who took breath-taking photographs in the skies above Edinburgh. Just as fascinating as his photographs, are Buckham’s dare-devil techniques to capture the perfect shot. He gave this sage advice to budding aerial photographers: ‘It is essential to stand up, not only to make the exposures but to see what is coming along ahead. If one’s right leg is tied to the seat with a scarf or a piece of rope, it is possible to work in perfect security’. Buckham also pioneered early layering of multiple negatives to create the perfect shot giving his photographs an ethereal, otherworldly quality. Another innovation explored in Planes, Trains and Automobiles is the Victorian phenomenon of the stereograph. Made of two nearly identical scenes, which when viewed together in a special device, create a single three-dimensional image, this new photographic technology essentially mimicked how we see the world. It sparked curiosity and encouraged the public to view images of far-flung places from the comfort of their own home. The natural association between travel and transport meant that modes of transport were one of the most popular themes for stereographs. This exhibition features over 100 stereographs from the National Galleries of Scotland’s collection in a dynamic wall display, alongside digital interpretations. 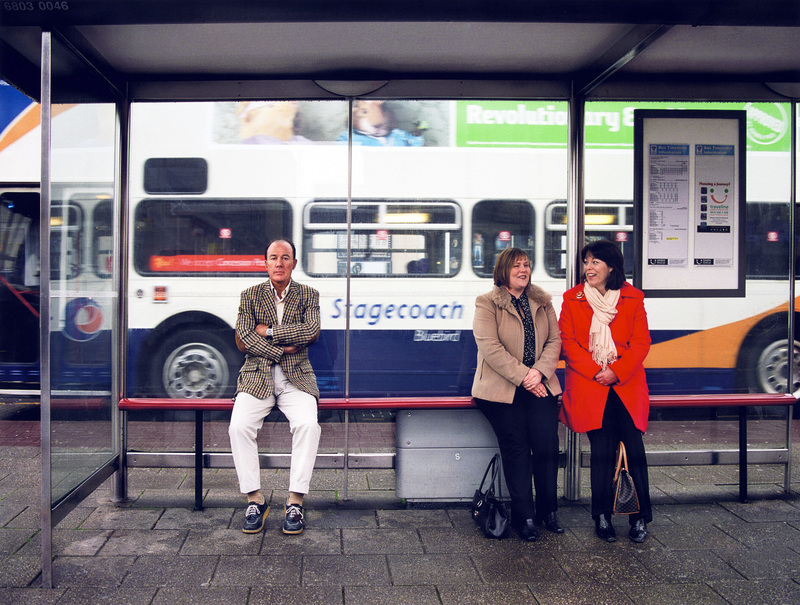 524 million journeys were made by public transport in Scotland last year and Planes, Trains and Automobiles explores this common form of travel. Photographers have been repeatedly drawn to the theme of commuting, fascinated by its ability to show humanity in movement, following regulated routes to work. Among these are documentary photographers Humphrey Spender (1910-2005) and Larry Herman (b.1942) who both made work observing Glasgow and Glasweigians on their the daily commute. From photographs of the iconic Forth Bridge to images of commuting, Planes, Trains and Automobiles is a photographic celebration of transportation in all its forms. 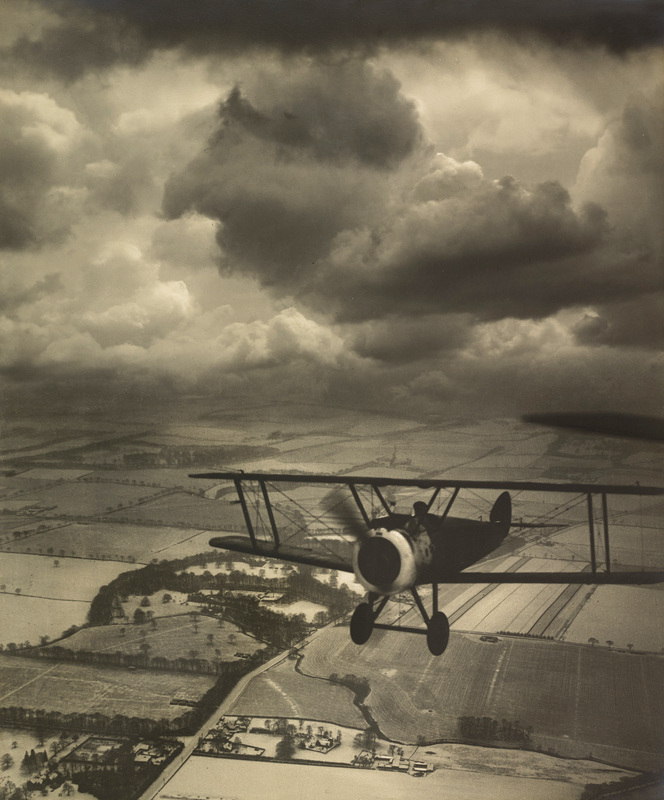 Buckham was the leading aerial photographer of his day and was renowned for his atmospheric shots of the landscape. He felt that the most spectacular cloud formations and theatrical light could be captured on “stormy days, with bursts of sunshine and occasional showers of rain”. This is an example of one of his shots of an impressive cloud formation. It features the R100 airship, noted for its more oval, aerodynamic shape in comparison to the traditional Zeppelin. The R100 embarked on its maiden flight in 1929 but in 1930 it was deflated and removed from service following the crash of her sister ship, the R101, with the loss of forty-eight lives. Buckham painted the airship into the scene by hand. This dramatic, and almost surreal photograph, shows the diversity of cloud formations during a fierce thunderstorm. 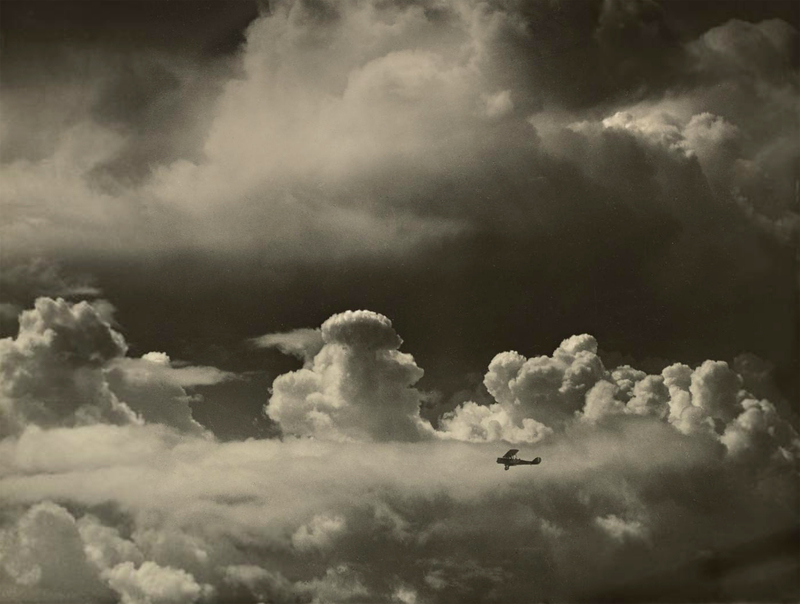 Over the years Buckham amassed a vast collection of photographs of skies which he could integrate with a separate landscape photograph to enhance the drama and create a more impressive composition. He also often manipulated his images further by adding hand painted aircraft, such as in this image, which heightens the viewer’s awareness of the dominating power and scale of the natural world. This image shows Captain Jordan flying his ‘Black Camel’ biplane at very close proximity to Buckham’s aircraft. Taken over the landscape around Rosyth, this was near to where Buckham crashed for the ninth time in 1918 and sustained serious injuries. Over the years he amassed a vast collection of photographs of skies which he integrated with a separate landscape photograph to enhance the drama and create a more impressive composition. This image over the Firth of Forth, encapsulates the romantic fusion of man’s engineering achievements against the dramatic beauty of nature. 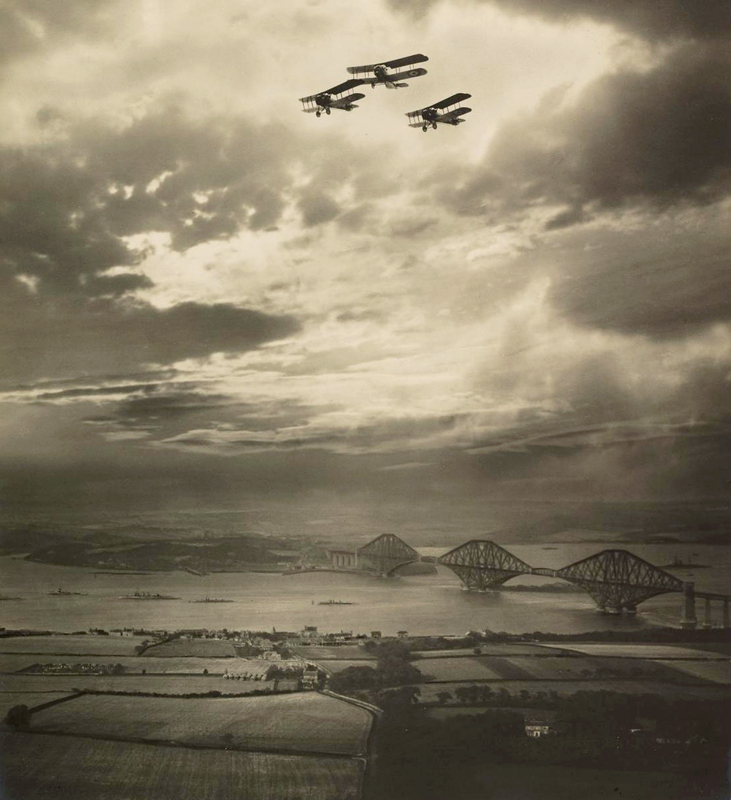 The three steel arches of the Forth Rail Bridge are mirrored in the three biplanes, which Buckham added later by hand, silhouetted against the spectacular sky. From the earliest days of manned flight, photographers sought to capture the strange and unfamiliar beauty of the view from above. 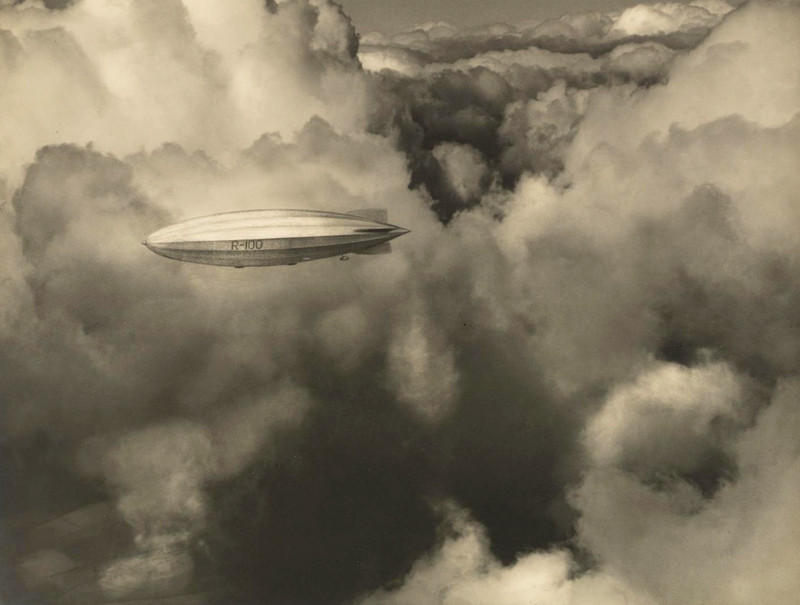 Whether it was from balloons, airships or later, fixed-wing aircraft, enterprising pioneers overcame formidable technical obstacles to create striking new images of the world below. It was, however, through warfare in the twentieth century that aerial photography came to prominence. Alfred Buckham’s remarkable body of work in the air had its origins in a brief, eventful career with the Royal Navy in the last phase of the First World War, but he was also able to develop a highly personal approach that combined his skills in documentary reconnaissance with an artist’s feeling for mood and atmosphere. Buckham’s aerial view of Edinburgh has become one of the most popular photographs in our collection. The view is taken from the west, with the castle in the foreground and the buildings of the Old Town along the Royal Mile gradually fading into a bank of mist with the rocky silhouette of Arthur’s Seat just visible in the distance. Buckham was always keen to capture strong contrasts of light and dark, often combining the skies and landscapes from separate photographs to achieve a theatrical effect. As he does here, he sometimes collaged or hand-painted the form of a tiny aircraft to enhance the vertiginous effect. Yet accuracy remained a concern; Buckham later professed a particular fondness for his view of Edinburgh, ‘because it presents, so nearly, the effect that I saw’. Buckham had crashed nine times before he was discharged from the Royal Naval Air Service as a hundred per cent disabled. Continuing to indulge his passion for aerial photography, he wrote that “If one’s right leg is tied to the seat with a scarf or a piece of rope, it is possible to work in perfect security”. Presumably these were the perilous conditions in which the photographer took this dazzling picture of Edinburgh. This is a very elegant composition, with an element of surrealism. It seems to have two perspectives and two vanishing points – the avenue of trees and the little figures on the left inhabit another world from the terrace of the houses on the right. The wealthy Mrs Eveleigh Nash in the foreground is, unexpectedly, shown as a shy woman. The two men in conversation walking by and the distant figures on the left are not so much a background as other lives being lived at the same time. The New York subway was officially opened in 1904, forty-one years after the London Underground and eight years after the Glasgow Subway. It is now one of the largest underground systems in the world. 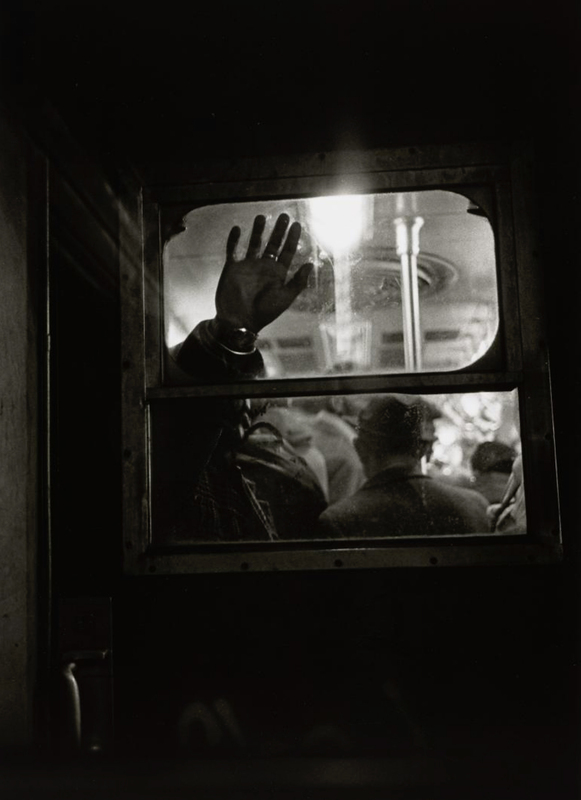 In this atmospheric photograph, Hudson captures the often claustrophobic experience of travelling underground with hundreds of other people. 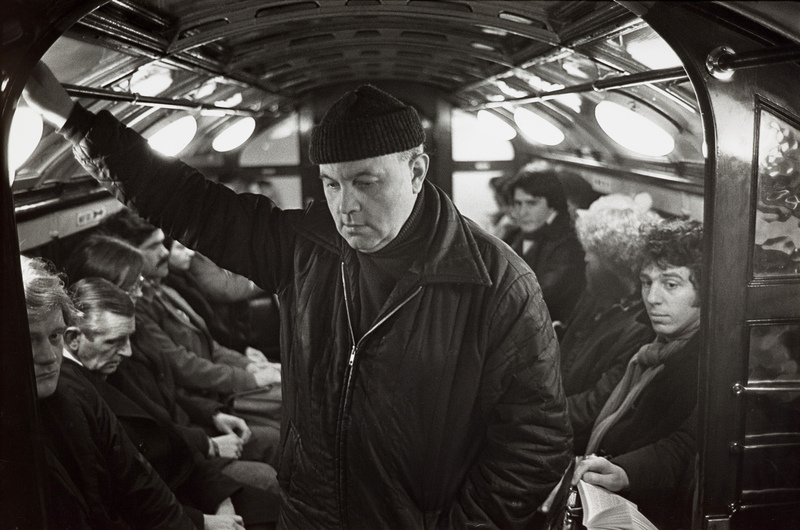 In the 1980s Mackenzie made a series of photographs depicting life in Glasgow, several of which show Glaswegians navigating the subway on their way to work. The Glasgow Subway opened in 1896, making it one of the world’s first underground systems. The Photographic Archive contains thousands of images from all over Scotland and beyond. Notable collections include work by Werner Kissling in the Hebrides and Galloway and Robert Atkinson’s images of the Western Isles. Ian MacKenzie’s extensive ethnological record, containing both still and video footage of local customs, festivals and working life, resides alongside his portfolio of fine art photography, of which the School of Scottish Studies Archives is custodian. MacKenzie was born in Inverness and grew up in the distillery village of Tomatin, Strathdearn. He graduated from Napier College and went on to London to obtain a masters degree in photography from the Royal College of Art. Throughout his life, his devotion to the Highlands inspired him to capture the essence of Scottish culture in his artwork, even when travelling abroad. He came to work at the School of Scottish Studies in 1985, where he was curator of the Photographic Archive for nearly twenty-five years. Aside from maintaining the existing collections, he travelled all over Scotland capturing scenes and customs on the edge of extinction. His photos reflect his belief that there is always room for the appreciation of the important things in life that are so often overlooked. His project ZenBends reflected this philosophy by focusing on the quality of day-to-day life rather than the constant pursuit of a final goal. The Ian MacKenzie Memorial Fund was established after his passing in 2009 and all proceeds go to the School of Scottish Studies Archives. For many of us, being pushed in a pram is the first mode of transport we will experience. 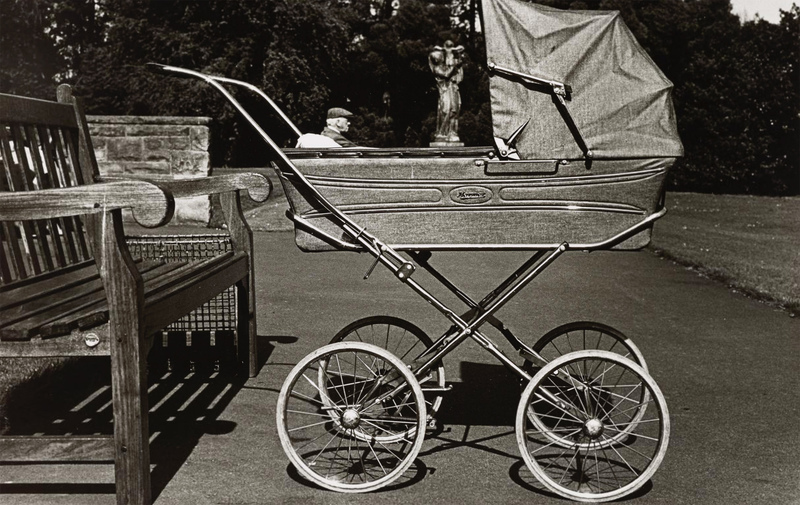 In this carefully composed photograph it appears that the baby is joined in the pram by a statue of the Madonna and Child and an elderly man – prompting us to contemplate the different stages of life. 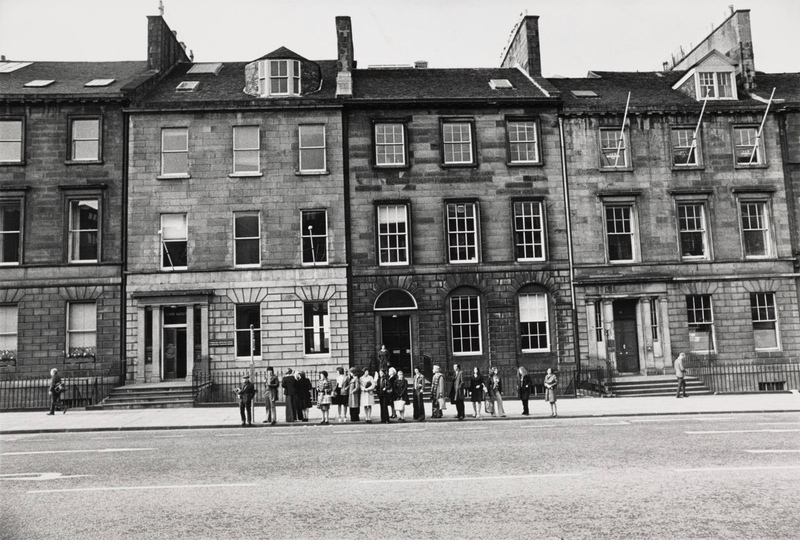 In 1980, when this photograph was taken, Inverleith House in the Royal Botanic Garden was home to the Scottish National Gallery of Modern Art. The collection was moved to its current location on Belford Road in 1984. The sculpture seen in this photograph, La Vierge d’Alsace [The Virgin of Alsace] by Emile-Antoine Bourdelle, can now been found in the grounds of Modern Two. Jeffrey Milstein is a photographer, architect and pilot. His photographic work reflects both his lifelong passion for flight (he received his pilot’s licence when only seventeen years old) and his love of architecture. Milstein utilises small planes and helicopters to create stunning aerial photographs which display a graphic designer’s eye for geometry and design. In addition to photographing from aircraft Milstein has also produced a body of work in which aircraft are the subject of the photograph. For these Milstein positions himself below the aircraft and photographs them as they pass overhead, preparing to land. 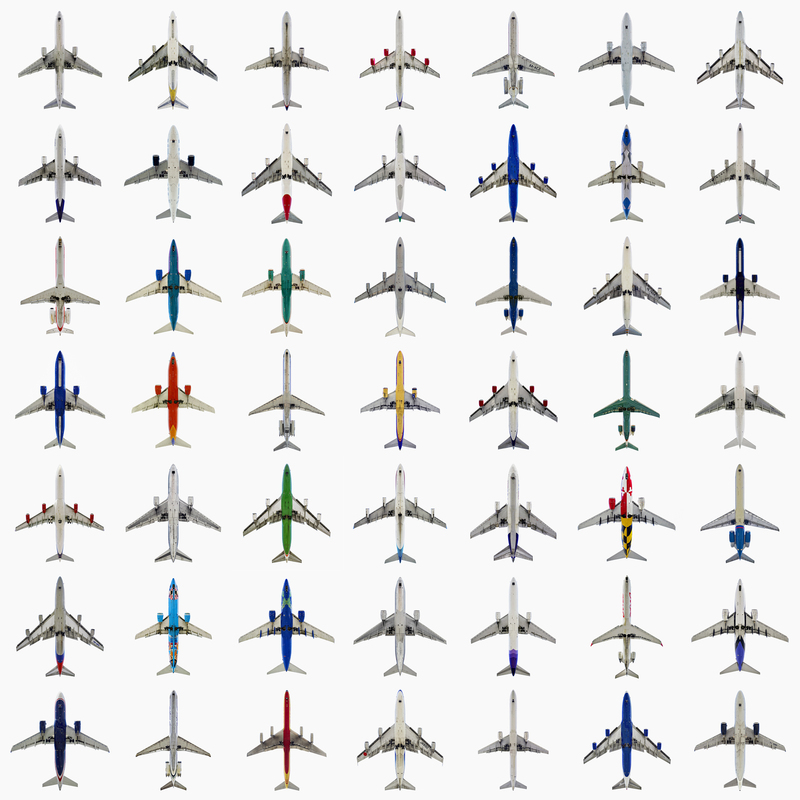 In the resulting prints Milstein removes the background to better focus on the colours and design of the aircraft. 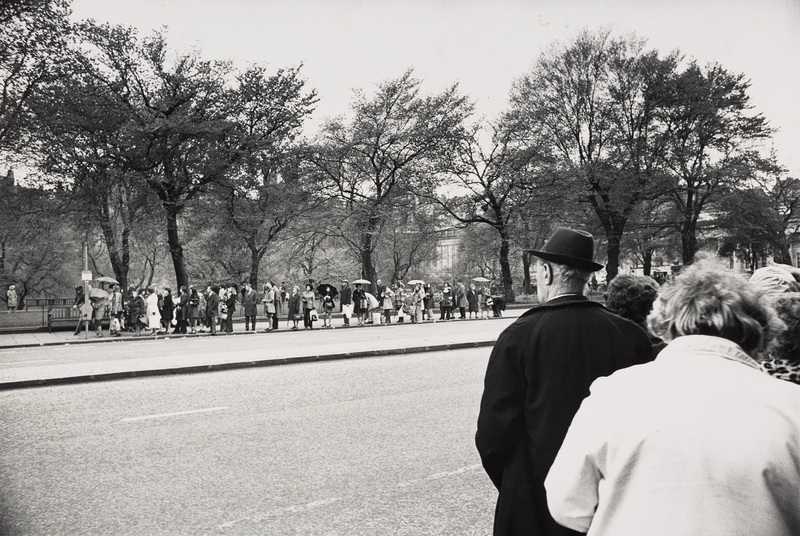 Milstein’s photographs have been exhibited and published worldwide. Video: ‘Cottees: There’s a lot to celebrate’ (2012) by GPYR-Melbourne / insidious racism? There is a lot to celebrate living in Australia, the lucky country, especially if you are a white kid growing up in the perfect world of Cottees advertising. I have been viewing these TV commercials since 1986 and have yet to see an Indian, Asian, Aboriginal or child from a Muslim family in any of them. As far as I can see it is only white children of middle class suburban families that can “seize the day” in Cottee’s vision of contemporary Australia. I ask my readers, do they think that these adverts promulgate a form of insidious racism? Are these adverts a form of racism by exclusion, rather than one by outright declamation? Is this exclusion a form of societal system of oppression? I leave the answer for you to decide. “This Sunday will see the launch of a new campaign for Cottee’s cordial. Created by George Patterson Y&R Melbourne, the commercial aims to take the brand back to its roots by celebrating the simple goodness of childhood – and the fact that no matter how many kids end up in your back yard at the end of the day, there’s always enough Cottee’s to go around.